A retail park or power center is an unenclosed shopping center with a typical range of 250,000 square feet (23,000 m2) to 600,000 square feet (56,000 m2) of gross leasable area that usually contains three or more big box retailers and various smaller retailers (usually located in strip plazas) with a common parking area shared among the retailers. It is likely to have more money spent on features and architecture than a traditional big box shopping center. In 1986, "280 Metro Center", an open-air, strip shopping complex composed of discount and warehouse retailers, opened in Colma, California in the United States; it is credited with being the first ever power center. Northern Lights Shopping Center in Economy, Pennsylvania, which opened in 1962, could be considered an earlier example of a power center based on square footage (it had 609,405 square feet (57,000 m2) of leaseable space until the demolition of the former J. C. Penney building in 2006) and having multiple anchors (it had four until the aforementioned demolition, with two of the remaining three anchors currently being vacant as of 2014), though it has largely become more of a traditional community-style strip mall since the early 2000s and is generally considered a dead mall due to its high vacancy rate. In recent years, it has become quite common for an older shopping mall to be renovated as (or replaced entirely by) a power center, adding big-box stores, category killers and strip shopping center-type buildings to the parking and open areas, rather than to add anchors and new retail space to the existing mall facility. Puente Hills Mall and Del Amo Fashion Center in Southern California are good examples of this. Other examples are Seven Corners Shopping Center in suburban Washington, D.C. and Deerfoot Meadows in Calgary, Alberta, Canada. Power centers are almost always located in suburban areas, but occasionally redevelopment has brought power centers to densely populated urban areas. Some new power center developments have attempted to re-create the atmosphere of an old-town Main Street, with varying levels of success. The Buywell Retail Park, on the Thorp Arch Trading Estate in West Yorkshire is unusual in being set in converted factory bunkers with grassed roofs, used in World War II. 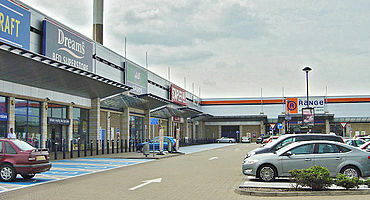 In the United Kingdom, the retail park is a similar concept to the North American power center. They are found on the fringes of most large towns and cities in highly accessible locations and are aimed at households owning a car, though there are often also bus services. They are an alternative to busy city centres. Such developments have been encouraged by cheaper, more affordable land on the outskirts of towns and cities, and with loose planning controls in a number of Enterprise Zones, making planning and development very easy. In recent years, in many areas across the UK, planning controls have been tightened to preserve the countryside. This has made it more difficult for such developments to proceed, resulting in many smaller, more compact retail parks, sometimes consisting of only three or four stores being built on former brownfield sites. There are also environmental disadvantages to large retail parks on the rural fringe, including the increased traffic and pollution that occurs during access. Typically retail parks host a range of chain stores, including furniture, clothes or footwear superstores, electrical stores, carpet and others - and the anchor tenant is usually a supermarket. Owing to their out-of-town sites, abundance of free parking and proximity to major roads, retail parks are often easier to reach than central shopping areas, and as a result town centres are less attractive to retailers. Kingsway West Retail Park in Dundee, Scotland, featuring a typical layout with the anchor store - in this case a Tesco hypermarket, with several large format retailers surrounding an expanse of customer parking and traffic access. ^ Retailing Management. 7 ed. Michael Levy and Barton A. Weitz. (2009). publisher: McGraw-Hill Irwin. ^ Parrish, Tory N (September 30, 2012). "Work on Wal-Mart supercenter set to begin in Beaver County". Tribune-Review. Trib Total Media. Retrieved July 6, 2017. ^ "About Us". South Edmonton Common. Retrieved July 6, 2017. ^ "Fairfax County EDA – Doing Business in Fairfax County, Seven Corners (retrieved Sep 2, 2008)". fairfaxcountyeda.org. ^ Bromley, Rosemary D. F.; Thomas, Colin J. (24 May 1988). "Retail Parks: Spatial and Functional Integration of Retail Units in the Swansea Enterprise Zone". Transactions of the Institute of British Geographers. 13 (1): 4–18. doi:10.2307/622771. JSTOR 622771. ^ Kollewe, Julia (16 April 2012). "Blow to UK high street as more retailers move out of town". the Guardian.